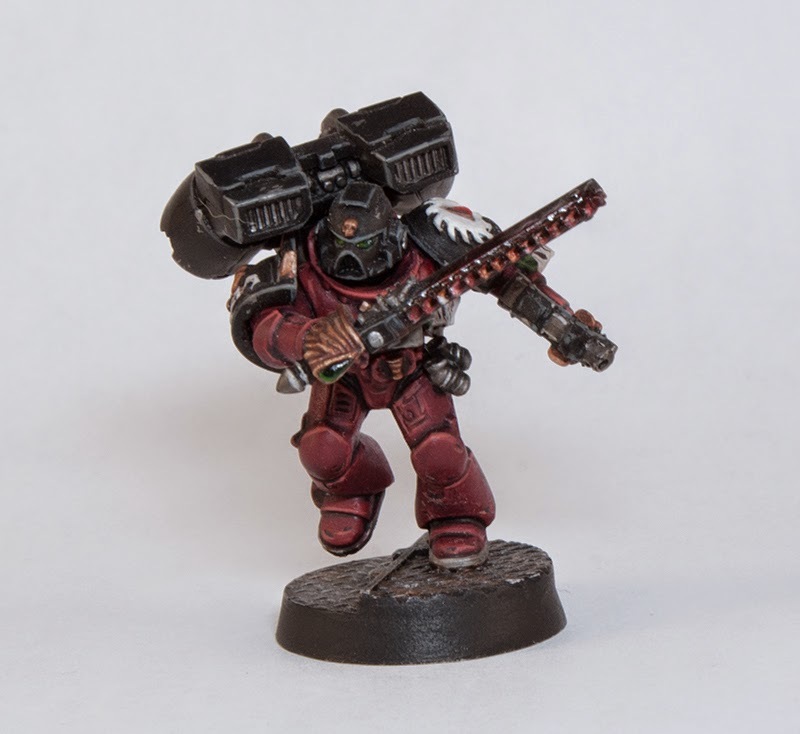 Mengel Miniatures: Bloody Angels, Rats, & the Mengel Miniatures Store! 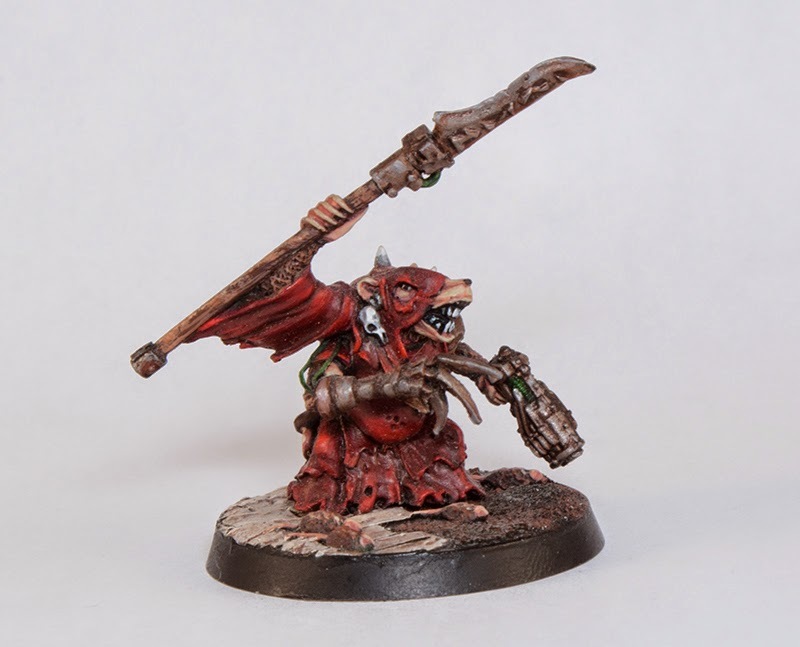 Bloody Angels, Rats, & the Mengel Miniatures Store! Today I have launched the Mengel Miniatures Store! It is where I will post up any models I have painted for sale on eBay as well as older models I find in my collection. 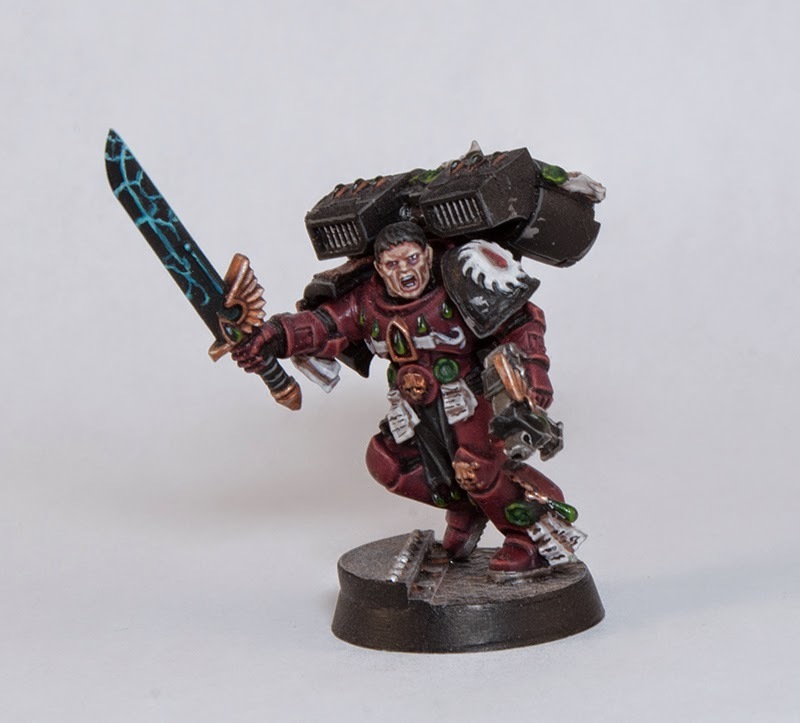 Don't worry, I have more then just an announcement for you today, keep reading to see some of the scions of Sanguinius. You can find the link for the Store in the top right corner of the website, right underneath the Forum and Painting Studio buttons. 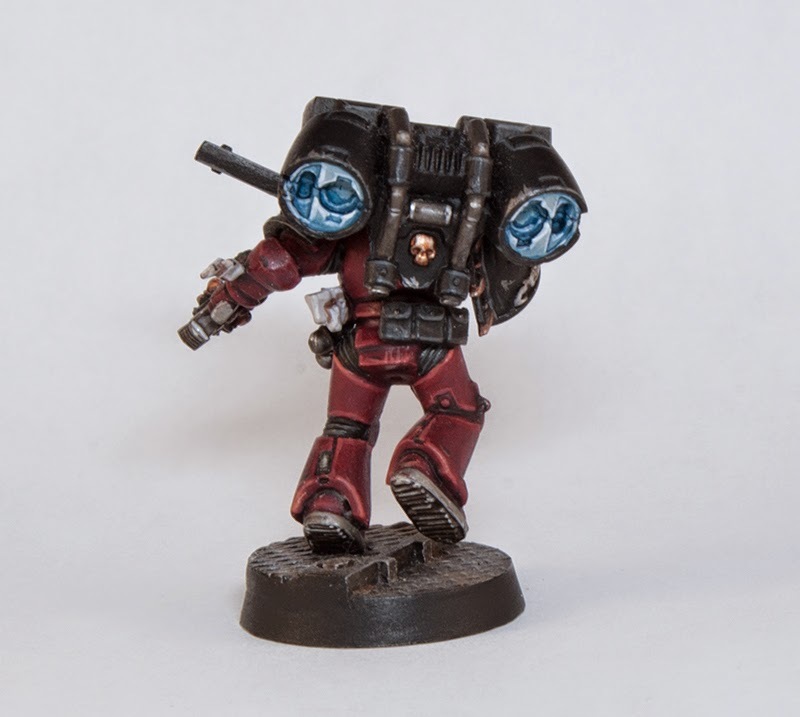 Every now and then I paint up a model specifically to sell, such as Valten. These go up on eBay and now I will be posting a link, picture, and starting price on my store page. To kick off the start of it I have quite a few older models from my collection in there that I decided to part with. As much as I would like to hang on to all of them, there comes a point where you have to decide whether you really need them anymore. One upside to this is that it forced me to take high quality pictures of some models that have never seen the sight of my photo booth before. 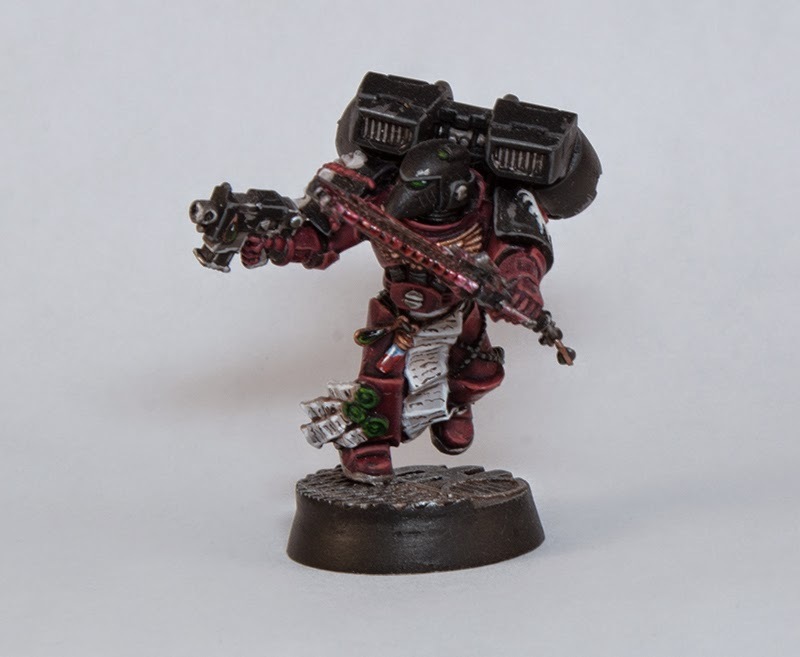 My Flesh Tearers have been in my collection for awhile now. I started them back around the time that the 5th edition Blood Angels codex came out but only made it to four models. 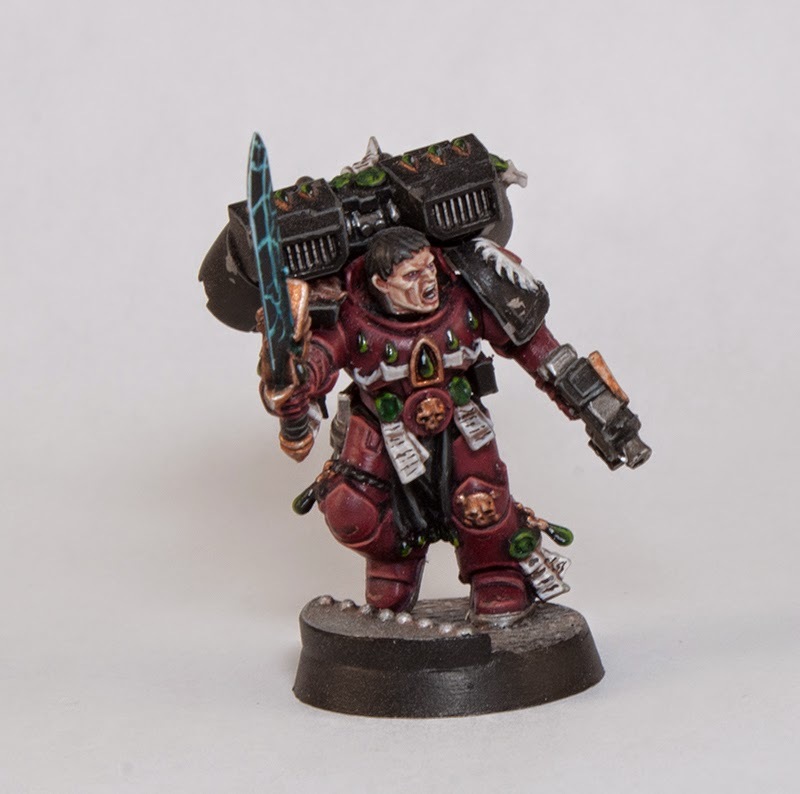 My friends and I originally planned on going to Adepticon that year for the team tournament with a Blood Angel themed force. 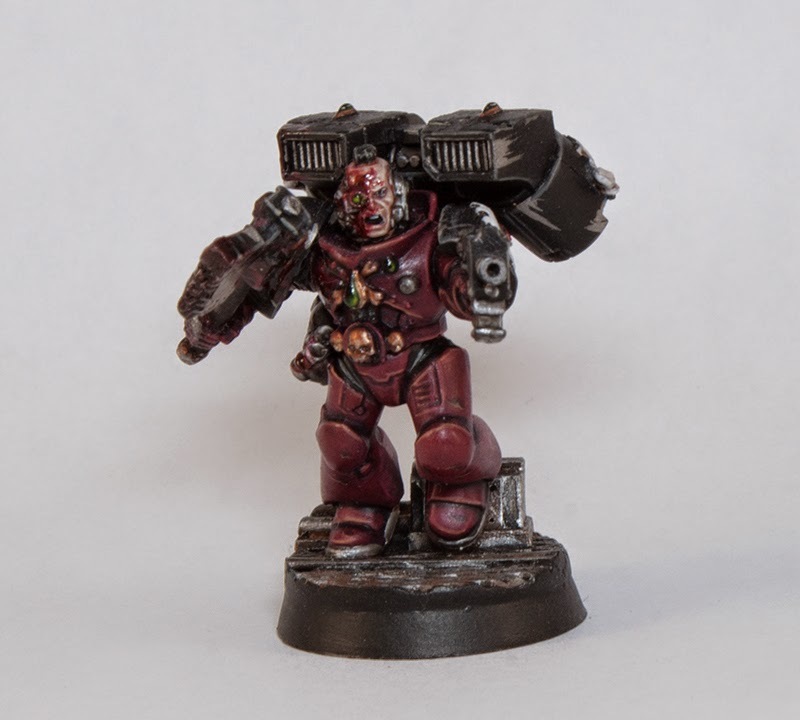 I really love the look and lore of the sons of Amit, and those new Blood Angel kits were the best we had seen at the time. I wanted to give them a brutal yet elegant appearance so they still tied into their parent Chapter. 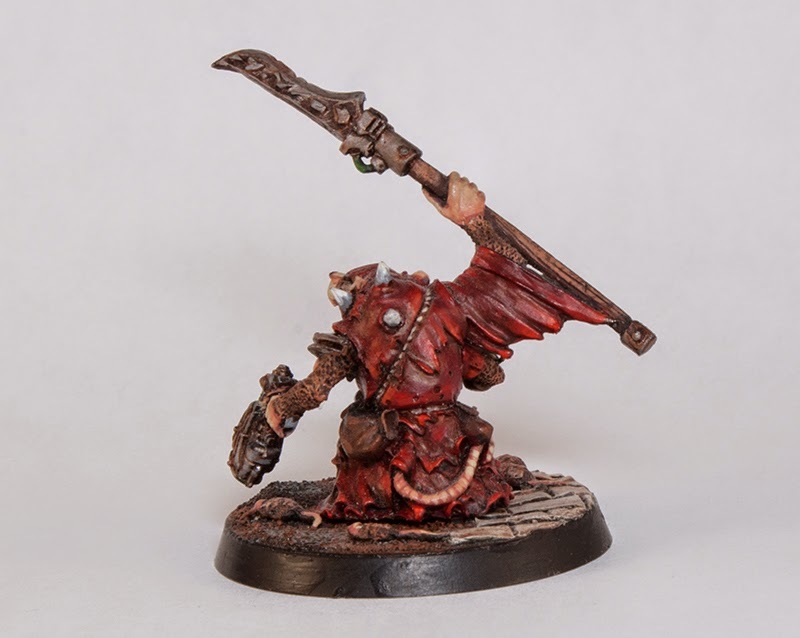 The painting formula for them involved a Red Gore base highlighted up with Vomit Brown and a final glaze of a Purple Wash. Unfortunately the purple wash was pretty inconsistent and would sometimes leave spots and "tide marks" that I would have to fix later. These are still pretty close to my basic Marine painting standard that I use now, although there are definitely things I have improved upon. It mostly just involves having become better at making thinner highlights. These guys were my first step into applying battle damage on models. It was a valuable learning experience, teaching me to refine it more. 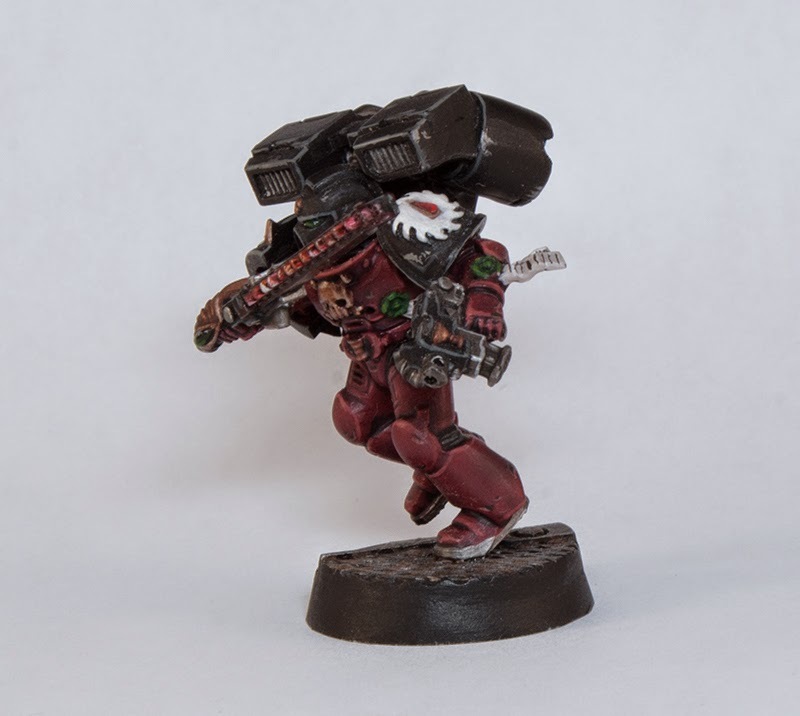 The guy above was particularly fun as he let me explore the Flesh Tearers more brutal aspects. I took the chain axe from the Bezerkers kit and sculpted a mohawk to make him look more intense. This was also my first time that I painted a glow effect into the jump packs. I still use this same formula today. It's a light grey base coat, followed by a wash of Blue. This is then re-layered with the same grey and highlighted with white. I also made sure to put white in the "hottest" areas where the flames would come out. The final step is to give the whole thing a thin glaze of blue. It's pretty simple but looks great. This is a force I would love to finish but I just don't see myself ever having the time. I still have my Astral Claws, more 40k Nurgle forces, my Tomb Kings, Orcs and Goblins, several Primarchs, Dreadfleet, Space Hulk, and an untold number of other random projects to get through. I do have Gabriel Seth still sitting unpainted though, so maybe we will at least see him get some paint at some point. I also have this guy, he's probably over a decade old, so the paint job is not the best. I still really like it though. 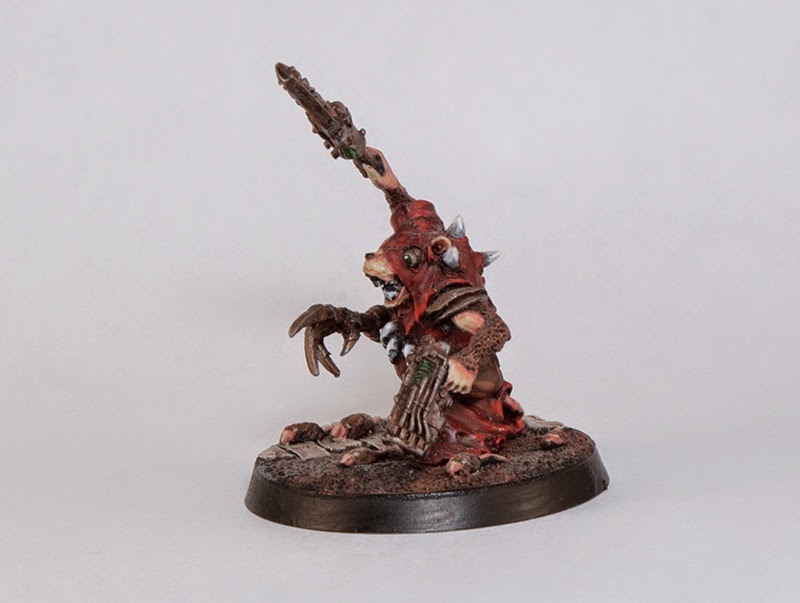 He was my attempt at converting a Hrud, back when they were still described as being Skaven in space for the most part. The base model was some special character from the old book whose name I can't remember. I took the mechanical arm from a Necron Flayed One and the plasma pistol from the Bezerker kit. The bionic eye, base and small rats were all sculpted. I also did one or two basic Hrud models from Gutter Runners but have since lost them. These guys and more including Valten, the Imperial Fist from my painting tutorial, a Plague Marine in pre-heresy colors and a plethora of other older models are all for sale now in the store. I won't do future posts like this specifically for the store, but if I have a particularly good model I will probably throw a shout out into whatever post is going up that day. Otherwise just check it out periodically to see what's available, I'll be updating it as models sell so it will stay accurate with what's available.